What is a stalemate? Learn it in this lesson. Stalemate is just a way in which a chess game can end. Like football, a game of chess can result in a win for one side or a draw. There are different types of draw. Stalemate is just one sort of draw, not another word for a draw. 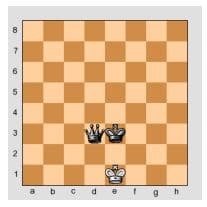 Stalemate is a position in which you can’t move anywhere your King (which is not in check) because he would be captured by an enemy piece on any adjacent square, AND you can’t move anything else. When this happens, the result of the game is a draw. No one wins and no one loses. It’s White’s turn. The White King is not in check, but where can he move? 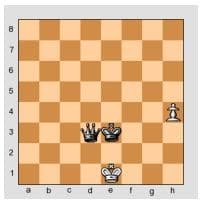 Nowhere: if he moves to d1, d2, e2, f2, f1 he would be captured by the Black Queen. So he can’t move: that’s a stalemate and the game is a draw. It’s White’s turn to move. Can the King move? No, because he would be captured by the Queen everywhere he moves to. However, White can – and MUST – move his pawn from h4 to h5. So this position is NOT stalemate: White has a move to do! Remember: stalemate means you cannot move ANY of your pieces, not just the king. At this point, you now know the difference between check, checkmate and stalemate.